Eagle Creek Park is still a lovely place to visit and enjoy. The leaves may be gone from the trees, but Eagle Creek Park is still a lovely place to visit and enjoy. Even though the weather may be a bit cold and the wind may blow, there is plenty to see and do inside at the Earth Discovery Center (EDC) and the Ornithology Center (OC). 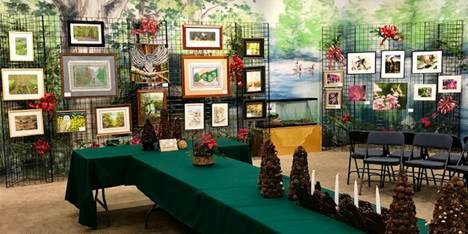 Through December 16th there are 123 unique art pieces in the “Celebration with Nature” Art Exhibit on display at the EDC. Fifty-one different artists using a variety of styles and materials created these works of art. One of these pieces may make a perfect gift for Christmas. Most are for sale. I have seen the show and was very impressed. Check it out. It is free with your park admission. See picture below of part of the artwork that is on display. The park will be closing at 6 p.m. through the rest of December and January. Make note of the early time due to getting dark around 5:30. Please note that the EDC, OC, and Park Office will be closed Dec. 23rd, 24th, 25th, and 26th as well as January 1, 2019. The park will still be open on those dates. Park Passes are now available for 2019 at the gate houses, park office, online, and through the Eagle Creek Park Foundation. There is a discount for Senior Citizens (over 62) and Veterans. An Eagle Creek Park Foundation pass gives money directly to Eagle Creek Park. Go on line or ask at the park office for more information. 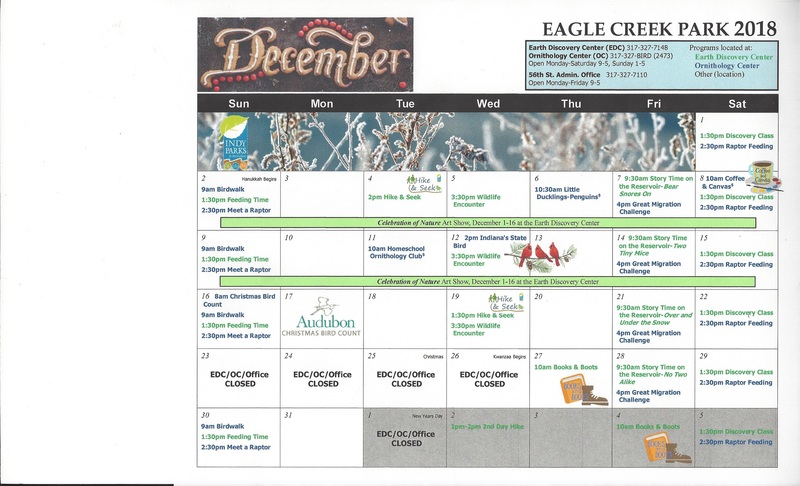 Attached is the December Calendar. Looks like there are some really interesting (and educational) programs for all ages and families. 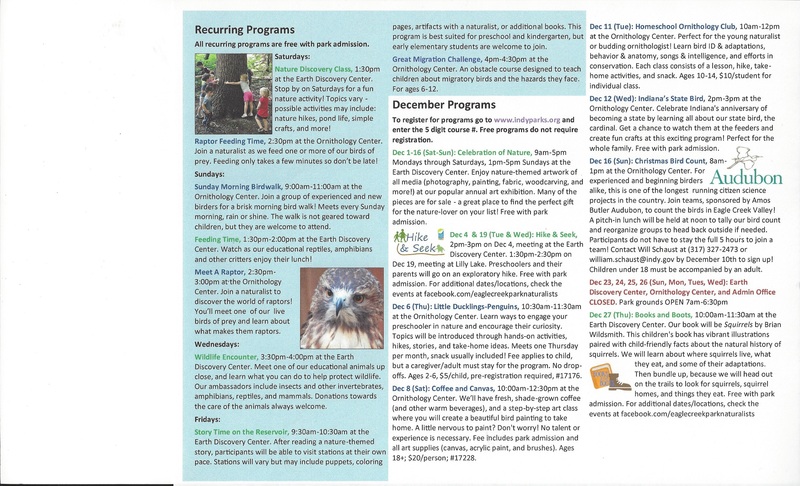 Check it out and enjoy this time of year at Eagle Creek Park.